Danny Lennon feels that his Clyde side have improved remarkably in the short space of time since he arrived at the club. The Bully Wee shocked League 2 title favourites Peterhead on Saturday to register Lennon’s first home win as boss - and the former St. Mirren manager was full of praise for his players. “Saturday was another very good performance from the players”, he explained. “The conditions didn’t allow either team to play good football but we still tried. The guys are playing a different kind of football now in comparison to when I came in. 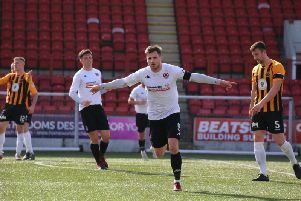 Saturday’s victory rounded off a terrific week for the Broadwood side with big wins against the league’s top two teams to show for their efforts. And Lennon said the players have taken on advice well. “There’s a good organisation about the players at the moment. We’re all learning from each other at the moment and everyone is really stepping up to the plate. I’ve asked them to go out and believe in themselves and be leaders out there and they’re doing it. Lennon’s side will now face Edinburgh City at Broadwood before travelling to Berwick. On the face of it, those two are very winnable given Clyde’s recent form. But the manager knows there’s still work to do. Match winner David Goodwillie had endured a frustrating afternoon but enjoyed the moment. The goal came just as Clyde were staring down the possibility of another home match in which they had failed to score. It may well turn out to be a massive moment in the Bully Wee’s season.